CBS wants an open and constructive dialogue with the key stakeholders in terms of the work on quality. In relation to study programmes, there is particular focus on having a dialogue with students, potential employers, graduates and examiners. 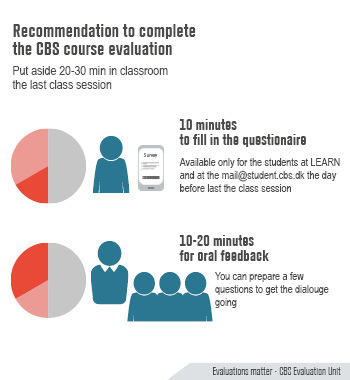 Read CBS' overall evaluation strategy here (CBS' quality policy is only available in English): CBS Evaluation Strategy. An essential element of the evaluation strategy is the students' evaluation of teaching. You can read the part of the evaluation strategy that concerns the students' evaluation of teaching here: CBS Evaluation Strategy.